Sugar addiction is the constant craving for sugar that has been found to have both a psychological and physical component. Carbohydrate addiction can dramatically impact your health for the worst, so you must stop sugar cravings for long term health and successful antiaging. Human beings are genetically hardwired for addiction. This does not mean that serious and life-threatening addictions are normal or healthy, but that we are designed to want to repeat behaviors that cause us to feel pleasure. Most of the time this is beneficial because most things that feel good ARE good for us. When this behavior-reward feedback loop involves a something that is dangerous or unhealthy, this is where that hard wiring has bad results, and jeopardizes our health and well-being. Carbohydrate addiction although not as serious as drug or alcohol addiction is a serious health problem that has to be overcome. Carbohydrate addiction is essentially the same because carbohydrates are sugars. When we talk about addiction to sugars, it is usually meant to suggest simple and refined sugars, rather than carbohydrates, which also include both simple and complex carbs. During World War 2 sugar was rationed in Great Britain and during that time heart attacks actually declined in the British population. Some health experts believe this was due to the reduction of sugar in their diets. diet of the British people for the 14 year duration of rationing. Sweet cravings have a similar pattern to drug use, and this appears to be because the same area of the brain is involved in both cases. The pattern involves increasing the consumption of sweets, withdrawal symptoms when sweets are taken away, and the urge to resume the pattern when sweets become available again. This mimics the classic signs of a drug dependency, because sweets alter the neurotransmitter balance in your brain, in much the same way drug abuse does. The connection between sweets, alcohol, and drug cravings is that they cause elevated levels of neurotransmitters that in the short term make you feel good. When these neurotransmitter levels drop you feel bad and want to consume sugar again to boost them back up so you can feel good again. If you have problems with sweet cravings, your goal should be to overcome them, and gain better control over the chemistry of your body and brain. 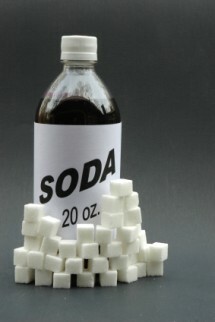 Over consumption of sugar is unhealthy, especially in the long term. Carbohydrate addiction poses the same risks. Here are some of the problems associated with it. Sugar addiction must be dealt with in multiple ways. You need to change your behavior, and give yourself compelling reasons to do it. The problems noted in the list above should provide some motivation for you. There are strategies to help you change this behavior and deal with sweet cravings. Choose low glycemic foods when planning meals and eating snacks. The best plan of action to break your carbohydrate addiction, is to slowly alter the foods you are eating. Thus you will go from simple carbohydrates to complex carbohydrates, with more fiber content that take longer to digest. This way you won't feel deprived, but will be eating in a way that will keep your blood sugar stable, control your sweet cravings and start to break down your sugar addiction. For instance you would go from white bread, to whole grain bread. Instead of the usual breakfast cereals, you would eat things like steel cut oats, or quinona, which have more fiber and are a better choice for blood sugar control. Remember that the key is reducing the desire for sweets, not just willpower! Gradually you should try and replace all of the refined processed foods you eat with fresh fruits, vegetables, proteins, and healthy fats, in a wide variety of food items that are unprocessed. Once you become adapted to eating this way, you will be well on the way to eliminating your addiction to sugar, because you will no longer have the sweet cravings that you once did.